With the new year just beginning it's the time where people reflect and attempt to make changes to their diet and lifestyle. I'm a no resolution kind of girl, that being said I'm always open to ideas when it comes to making changes that positively effect my health. The princess and I are self confessed caffeine junkies. I personally can't operate without my large morning cup of coffee accompanied by a few squeezes of caramel syrup. 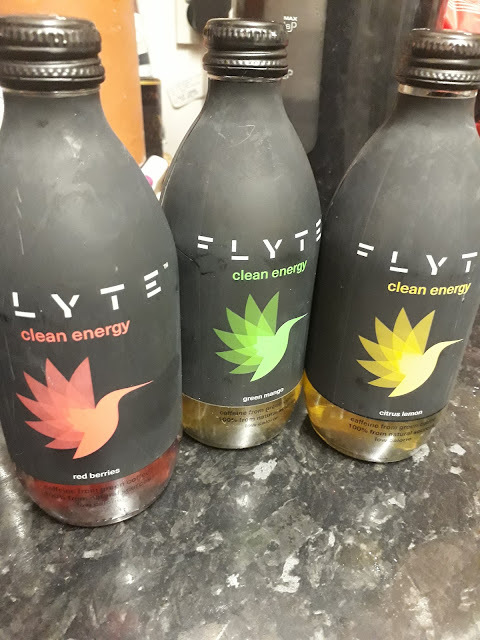 When the opportunity arose for us to try flyte, which is a clean energy drink from 100% natural sources that is powered by green coffee caffeine, we thought, why not? When the drinks arrived I must say I was pleasantly surprised with the packaging. Although a little dusty looking the packaging looked like it would suit the alcopop or cider isle, which suits me just fine, sort of clean with an edge. I took a sip of the red berries which was odd but refreshing and decided the teen could have that one. I went with the citrus lemon, which also had a slightly odd taste, it took me a couple of sips to get used to it then I found it quite refreshing. The teen drank hers to get a little buzz to keep her going while she completed some school work, she said it gave her the energy she needed to work through the night. I drank mine for a general energy boost. I must say although I was sceptical, it did give me that extra little boost in the morning without the need for my usual coffee. So overall the verdict was unanimous. Flyte is definity a drink that gives you an extra boost without the caffeine crash and the refreshing flavours are an additional plus point. Whilst I'm not ready to give up my morning coffee just yet, I'm very willing to carry Flyte to the gym for a post workout boost. This is a review post, the opinions are my own. I was given the Flyte drinks for the purpose of review.